Hello all my crafty friends, sorry it’s been a few weeks since I’ve posted. I’ve been very busy doing holiday stuff. Is everyone ready for Christmas? I’m getting there, I’ve got most of my holiday shopping done and most of my decorations up. There’s only a little bit left for me to do and then I can relax and enjoy the rest of the holiday. 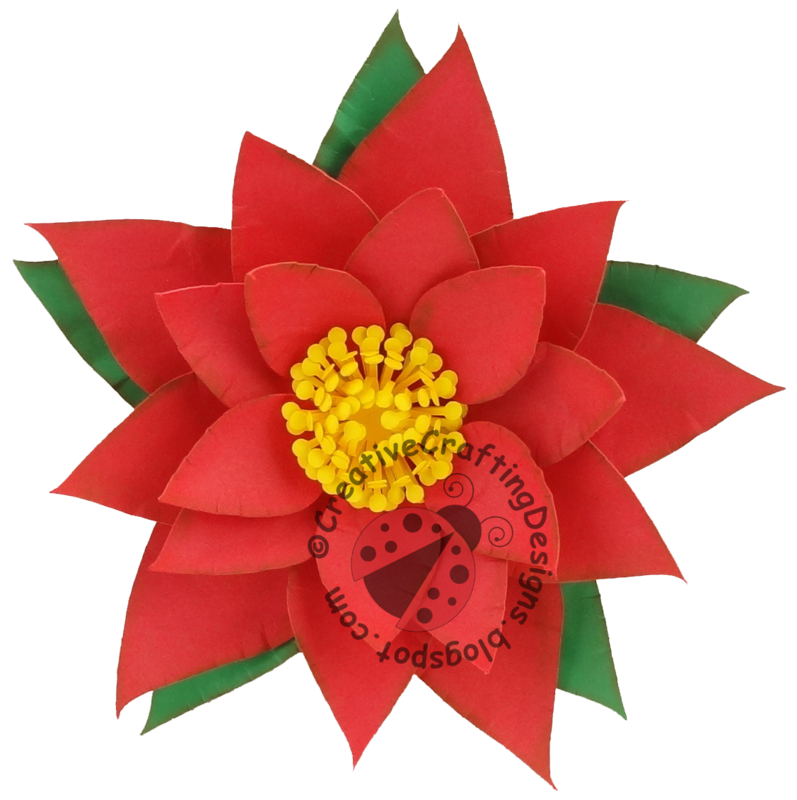 Today I have another file I created to share with you (freebie download at the end of this post) It’s a 3D poinsettia! And, a really pretty one at that. I have to say I’m very happy with how the poinsettia turned out and absolutely love the card I made; it’s simple but beautiful. To start with I cut all my pieces out using my Cricut Explore and Recollections cardstock. I then shaped all the petals using a stylus and some craft foam. There is a video below showing how to shape flowers using this technique. I then began gluing the petals together. I started with the largest petals, applying Scotch Quick-Dry Adhesive to the center, and layering up until I got to the smallest petals. Please note that this video is not an affiliate video, it’s purely for an example only, I don’t even own the Heartfelt Creations Deluxe Flower Shaping Kit. But, it is one of the things at the top of my list. Also, please note, this is not my video and I claim no rights to it. The video came from Heartfelt Creations on YouTube. The tool I actually use is made by McGill and is a much cheaper option. And for the foam pad I use either craft foam or an old mouse pad. The mouse pad I use is actually one with a soft fabric top and is thick and squishy. Now, the company that makes the stylus I use also makes a foam pad. Here are links to the stylus and foam pad made by: McGill Paper Blossoms Tool Kit and McGill Paper Blossoms Molding Mat (these are not affiliate links either). I then began working on the center of the flower. I used my stylus and craft foam again but only on the small circles. I took my stylus and pressed right in the center of the circle to create a curve in the center. For the outer half of the center I folded the small circles outward and for the inner half I folded them inward. I then went from the bottom part of each center piece, and gently folded them upward. I glued each center piece on top of the other using a small dot of Scotch Quick-Dry Adhesive, then attached it to the center of the poinsettia. I then adjusted the center piece a little more to get the look I was happy with. After I attached everything I used some miscellaneous brown chalk from my craft stash and applied it to the edges of the petals to give it a little more dimension. To make the card itself, I used cream colored Recollections cardstock stock and Merry Christmas script scrapbook paper. I attached the paper using my Elmer’s CraftBond Tape Runner. For the gold ribbon I actually ran it through my Xyron Sticker Marker, it makes attaching ribbons easy peasy. I finished up my card by attaching the 3D poinsettia to the card using Scotch Quick-Dry Adhesive. So, that’s enough about my card, lets get on to the freebie. Please, please comment below and let me know what you think of my file. When you click the “Download Here” link below the picture it will take you to the download (Google Drive) once you are there, click the upside down arrow at the top of the page, then it will download. The freebie includes SVG, DXF, JPEG, PNG, and Print and Cut Files. ** Please note, each freebie download will be available for 2 weeks so make sure you get it while you can. Also, I’ve decided to leave my other files up a little longer for now, just in case you missed them. Links can be found under the Freebies tab in the navigation bar at the top of the page. Previous PostGobble Gobble Gobble.. Pilgrim Turkey Card.. Plus Freebie SVG File and Digi Stamp!